Toxocara canis (dogs only), Toxocara cati (cats only) and Toxascaris leonina (dogs and cats), also known as ascarids, are common internal parasites. Roundworms may cause or contribute to diarrhea, stunted growth, poor haircoat, and poor weight gain. 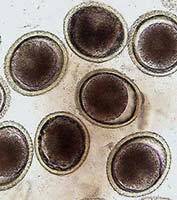 These parasites live in the small intestine of infected dogs or cats and the infective eggs are shed in the feces. 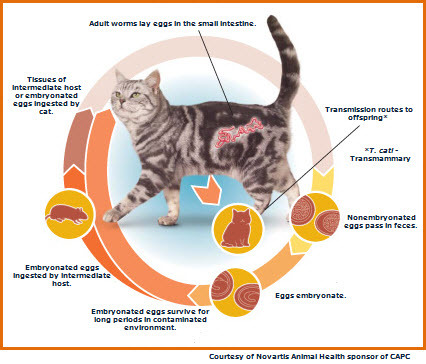 Dogs and cats become infected with ascarids via ingestion of larvated eggs from a contaminated environment or ingestion of other vertebrate hosts that have consumed larvated eggs and thus have larvae in their tissues. Toxocara species can also cause infection by a transmammary route. T. canis can cause infection transplacentally as well. This is how many pups become infected. The life cycle of the roundworms is slightly different for each species of roundworms, but, in general after infection, the parasites migrate through the liver into the lungs (Toxocara species only), within the wall of the GI tract (all species mentioned), or within the tissues (Toxocara species only). Click on the image below to view a video from CAPC about intestinal roundworms. Toxocara canis accomplishes its life cycle in dogs, with humans acquiring the infection as accidental hosts. Unembryonated eggs are shed in the feces of the definitive host . Eggs embryonate and become infective in the environment . Following ingestion by dogs , the infective eggs hatch and larvae penetrate the gut wall. In younger dogs, the larvae migrate through the lungs, bronchial tree, and esophagus; adult worms develop and oviposit in the small intestine . In older dogs, patent infections can also occur, but larval encystment in tissues is more common. Encysted stages are reactivated in female dogs during late pregnancy and infect by the transplacental and transmammary routes the puppies , in whose small intestine adult worms become established . Puppies are a major source of environmental egg contamination. Toxocara canis can also be transmitted through ingestion of paratenic hosts: eggs ingested by small mammals (e.g. rabbits) hatch and larvae penetrate the gut wall and migrate into various tissues where they encyst . The life cycle is completed when dogs eat these hosts and the larvae develop into egg-laying adult worms in the small intestine. Humans are accidental hosts who become infected by ingesting infective eggs in contaminated soil or infected paratenic hosts . After ingestion, the eggs hatch and larvae penetrate the intestinal wall and are carried by the circulation to a wide variety of tissues (liver, heart, lungs, brain, muscle, eyes) . While the larvae do not undergo any further development in these sites, they can cause severe local reactions that are the basis of toxocariasis. The two main clinical presentations of toxocariasis are visceral larva migrans and ocular larva migrans. Diagnosis is usually made by serology or the finding of larvae in biopsy or autopsy specimens. T. canis can cause visceral larval migrans and ocular larval migrans in humans. Visceral larval migrans in humans results in skin rash, fever, failure to thrive, neurologic signs, cough, pulmonary infiltrates, and enlarged spleen and/or liver. Ocular larval migrans in humans results in blindness. Children between 1 and 4 years of age are most at risk. Humans are infected by ingestion of larvated eggs. Roundworm infections are preventable and treatable. Monthly deworming is the safest method of action. Many products are available for your dog or cat.